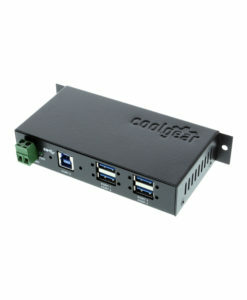 The newly redesigned Coolgear USB 3.1 4 port metal industrial hub complies with USB 3.1 Gen1 standards capable of up to 5Gbps data transmission. It supports 7-48V through its 2-pin plug connector for extra power to hungry devices (power adapter sold separately). The Coolgear USB 3.1 Gen1 hub is a 4 port industrial hub with a small form factor that accommodates up to 5Gbps of data transmission. It’s both surface and DIN Rail mountable with its included DIN Rail clips and screws. It supports Windows 7, 8, 8.1, 10, Linux, and Mac OS10.X operating systems and supports 5 hops to cascade with other hubs. The USB 3.1 4 port hub is small enough to fit in the palm of your hand yet can handle large amounts of super-speed data from its downstream ports. Each of the USB 3.1 ports supports the battery charging specification 1.2 for normal charging at .900mA per port. Normal charging allows the USB hub to charge low power devices that depend on charging to operate. 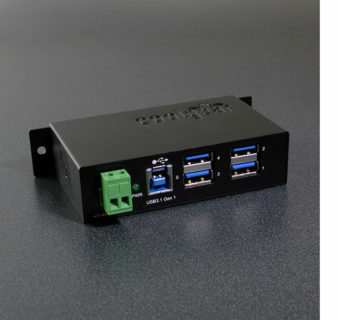 Operating USB equipment such as printers, scanners, portable drives, virtual reality gear and others are not a problem with this USB 3.1 Gen1 hub. Perfect drop in replacement for the Previous USB 2.0 Model 4u2ml.